FiberPhiladelphia 2012 continues to thrive city-wide in local galleries, major institutions and art collectives, as the international fiber biennial continues its festival throughout the area. Strings + Things, currently at the 3rd Street Gallery in downtown Olde City, features significant pieces by fiber artists Melissa Maddonni Haims and Carol Wisker. 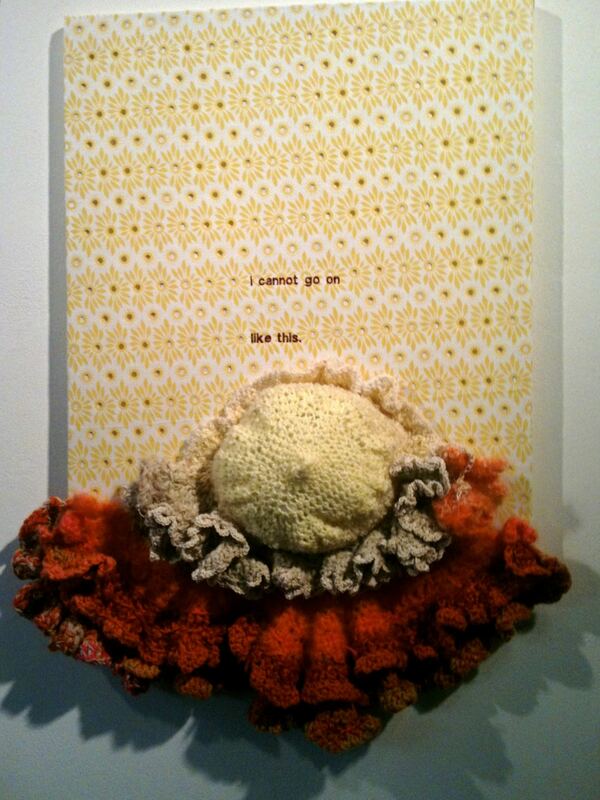 Maddonni Haims’ Purge series showcases several pieces hung relief-style from the gallery walls, such as I cannot go on like this (Vintage fabric, embroidery, hyperbolic crochet, 2012). Even though there are several longer, dramatic “epic” wall pieces, this is the one that is screaming to be touched (though I dare not) due to the soft-looking, attractive qualities of the Maddonni Haims-style “yarn cascades” that buttress the base of this relief, in a style known as “hyperbolic crochet”. Contrasting to that soft cascade is the embroidered text statement of the work’s title – reminiscent of conceptual artist Jenny Holzer (b.1950) in her very famous outdoor pieces that used text as image but on a grandiose scale of a highway billboard or her L.E.D. signs of projected text. 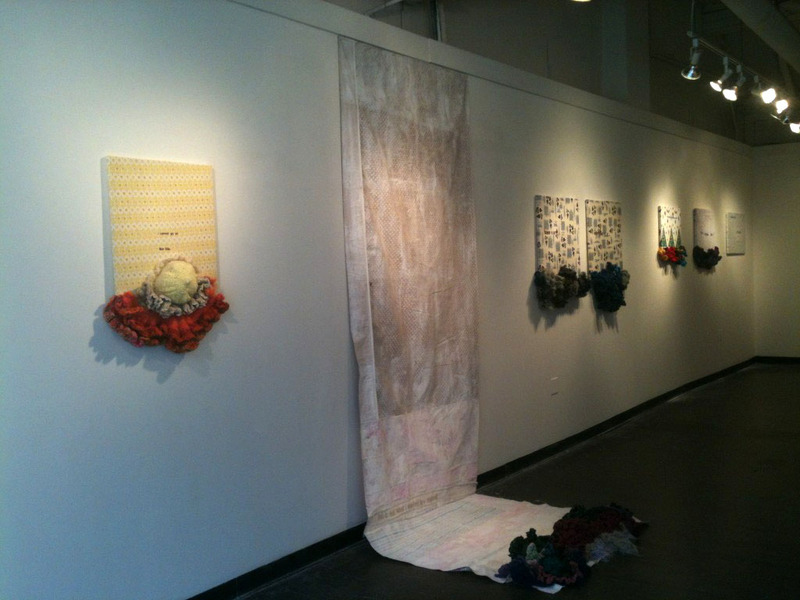 This is not what I wanted for myself (2012) is a wall-hung fiber piece constructed of vintage fabric, embroidered text and much darker, hand crocheted yarn cascading at the base. One cannot help but wonder about the play of hand sewn fabrics placed with almost-flawlessly embroidered fonts employed by Haims that she must have machine-embroidered. So much of the lore of this piece is hand-constructed through crocheting and quilting of found-fabrics. However, the sewn text of the piece’s title uses a light tan thread, as if the artist is trying to “sneak in” a commentary in two ways: first, by projecting this text against very similar muted pastel tones of her chosen, found fabrics she’s quilted together; and secondly, by complimenting the parallel base of the gallery wall itself that Haims’ embroidered text runs horizontally along. Maddonni Haims is using a parlayed Victorian-style aggression at its finest. Carol Wisker is a mixed media artist who works in varying degrees of fiber, in addition to prior works where she used diverse recycled materials such as metals, mesh, clothes line and paper. 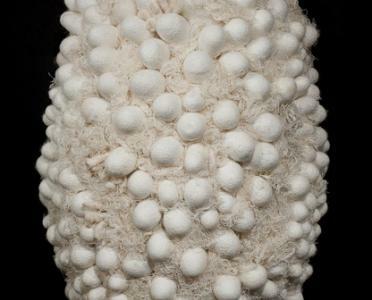 Density (various mixed media, 2012) is one of her works in this exhibit that utilizes an ovoid form but devoid of any color, rather using neutral colors found in objects of nature such as silk cocoons or cotton. One could be reminded of the constructions of artist Eva Hesse (born 1936, died 1970) who essentially brought public the ideas of “cocoon-as-art”. Hesse was one of the first women artists of this century to employ unconventional materials such as Wisker is doing here. Wisker’s use of repetition and consistency of oval forms harkens back to feminist notions of artists (throughout history) constructing objects, or painting abstract pieces that seem to “auto-represent” the female form. Strings + Things can be seen at 3rd Street Gallery, located at 58 N. 2nd Street in downtown Olde City, Philadelphia, though April 29, 2012, in conjunction with FiberPhiladelphia 2012.
interesting stuff – the work feels visceral and immediate – the Wisker piece has a particular mysterious quality. I agree – I could have written much, much more about both artists’ pieces in this show. Thanks for your comment! I love the work here. As a native of Philadelphia and a former member of Highwire Gallery when it was located on 2nd street, I am glad to see that 3rd Street Gallery is still bringing great art to the community. Thanks for the post. The artists at 3rd Street Gallery are consistently producing great work – you are right! Nice to meet you, Walter. Thanks for commenting and stopping by. I love her work, too. This was such a fantastic show that’ll always “burn” in my mind…thanks so much for your visit and lovely comments!